This part is easy. Right now, every surefire scout tailcap and tape switch combo will work with every Surefire Scout. This includes the M300, M600U, M300V, M600V & the M600DF. They’re 100 % interchangeable as far as tailcaps and switches are concerned. It is important to note that head on the M600DF is larger and will not work on the previous generations of Scout lights. The Surefire M952 light with XM07 tailcap and IR filter. First let’s discuss the tape switch options. You can buy the tailcaps and switches by themselves or as a combo (which we will cover later) but for now we’ll isolate the caps and switches so you can know what each does. Right now there’s currently (3) tape switch styles in production. The ST tape switches are available in several lengths with the most popular one being 7 inches. This is a single function tape switch that is momentary only. The latest version has some improvements over the older model which include reinforcement where the cable meets the pad and pronounced edge around the pad itself. This makes the switch more reliable and extends the life. These switches need to be secured to the rail by a mount like one from Cloud Defensive or Magpul. You can also secure it using velcro, tape or rubber bands but these are less permanent and less reliable methods. Next is the SR series of tape switches which are extremely popular and regarded by most to be the best option currently out there. It offers the momentary activation pad and also provides a constant on button at the front of the unit. The user can easily switch between the two at will. The SR pads are available in several lengths too with the most common being 7 inches. Another great feature of the SR tape switch is the built in picatinny mount. This rail grabber mount will allow you to mount the switch to any picatinny rail without the need for any aftermarket mounts or products. It also has built in channels for zip ties if you want to secure it further but the built in system is very secure. If you want to make absolutely sure it doesn’t go anywhere there is a modification that allows you to use the Cloud Defensive LCS but it will most likely void the warranty on your tape switch. You can read about it HERE. Last is the SR-D-IT series. These are for use with DBAL or ATPIAL lasers and allow you to activate both your light and the laser from one switch. The switch has two separate pads mounted in-line with each other and they are both momentary only. They have the built in rail mount like the SR series and won’t require any aftermarket product to use on a rail. The Surefire SR-D-IT tape switch installed on a rail. For tailcaps you basically have two options. The first is the UE tailcap which replaces the z68 tailcap (clicky) included with the Scout series of lights. It will allow you to use a tape switch and is available in both black and tan. The Surefire UE tailcap. Available in both black and tan. The UE tailcap on a M600DF Scout. (Kinetic Development Group mount and Railscales G10 scales and Karve handstop. The other option is the DS tailcap which is dual function. This one has a clicky tailcap and also a plug to accept tape switches. The cap is a two piece, waterproof design that allows you to rotate the cap to get the perfect position for the cap. It’s very similar to the XM tailcap found on the Millennium series of weaponlights. 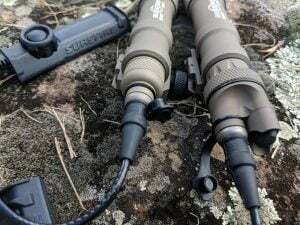 Now that we’ve established the different tailcaps and switches, we’ll take a look at the different combinations that Surefire offers. Buying the combos will save you money versus buying the parts individually. UE07 ($79.00) This combo includes the UE tailcap and the ST07 tape switch. UE-SR07 ($129.00) The most popular setup since it is comparatively inexpensive and gives you the SR07 switch. It’s also available in Tan so you can color match to your Tan Scout. You can also purchase the components individually as well as other lengths than the standard 7” cable. We have the 9″ SR-D-IT tape switch as well as the 9″ SR09 tape switch available. If you choose to, there is a way to use a tape switch on your 1″ body Surefire handheld light. In the past this was a great way to get a 1,000 lumen light on your rifle (Surefire P3X). Unfortunately they will NOT fit the new Fury DFT since the body is slightly larger due to the 18650 compatibility. The XM07 assembly is available on our site and it’s fairly easy to find the XM tailcaps on the used market. If you want to mount a handgun light such as the X300U-B, XH30 or XH35 on a rifle or PCC, the XT07 tailcap will allow you to run your choice of tape switch. This comes with a replacement battery hood door that has a plug for a tape switch (SR07 included). It also has the normal activation paddles as well as a lockout toggle switch to prevent accidental activation during storage or transport. The XT07 includes the SR07 tape switch. While we’re on the topic of handgun tape switches, there are also DG switches for use on handguns. These will activate the light when the pistol is gripped. The DG switches are handgun specific but there’s a good thread on Primary & Secondary that shows cross-compatibility.